It is debatable whether [Jamie] upgraded his Power Wheels Jeep or built a beast of a mini vehicle and only added a Power Wheels Jeep body. Either way, this Racing Power Wheels Jeep is awesome. The goal of the project is to race in the Power Racing Series races held at Maker Faires. This vehicle is no joke. It is still electric but runs on 24volts DC. It has pneumatic rubber tires for traction and disk brakes for stopping. The ‘gas’ gauge is a volt meter mounted into the dash next to the motor temperature gauge. As if that was not enough, the headlights and tail lights work. Take note of that sweet custom frame, it was mostly made from an old bed frame. If you had a Power Wheel vehicle as a kid you may have been the envy of the neighborhood. Even as fun as they were you probably out grew them. Lucky for a few youngsters, [Bob] hasn’t. Not only does he have several Power Wheels for his children to use, he does some pretty cool mods to make them even more fun. If you had a few too many trick or treaters hitting up your house this year, [phwillys] has a solution guaranteed to keep them from coming back. 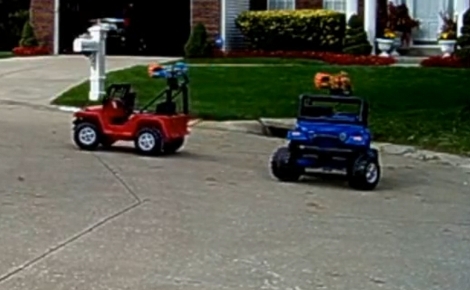 He was looking for a way to scare the crap out of the trick or treaters this past Halloween, so he constructed a remote-controlled evil jeep to terrorize the neighborhood. The jeep was built from an old PowerWheels car, and uses a bunch of different motors to get the effect [phwillys] was looking for. He bought a linear actuator on eBay to let him steer the jeep, which is controlled using some motor controllers he had left over from another project. 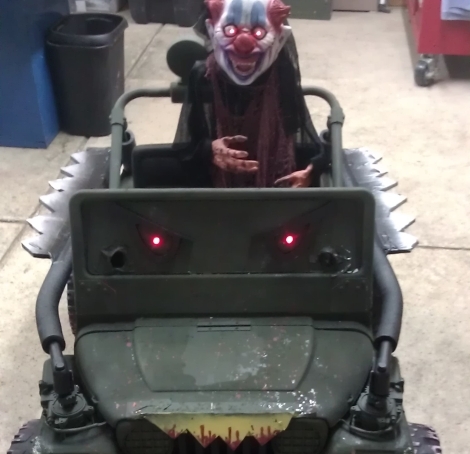 A salvaged car window motor was used to allow evil clown driver to turn from side to side in his seat, while a pair of car seat motors activate the giant claws built into the sides of the vehicle. The jeep’s hood was even turned into a chomping mouth with large teeth using yet another small motor. [phwillys] also added a water sprayer to the clown’s mouth, soaking any kids in the immediate vicinity, though he was nice enough to mount a leaf blower on the opposite side of the vehicle to help blow them dry. It really is an awesome creation, we’re sure the neighborhood kids (and parents) got a big kick out of it. Continue reading to see a short video of his scary clown car in action. The Warthog from Halo is one of the most beloved video game vehicles. [Tim Higgins] brings the fun to life with his laser tag Warthog game. It uses Barbie Power Wheels toys as a base and adds laser tag weaponry. Xbox 360 controllers are used but just like in Halo, you can’t control the gun and the vehicle at the same time. We’ve encountered [Tim’s] love for water-based amusement before and this did originally start out with a water cannon powered by a wind-shield washer reservoir. Take a look at the videos after the break as well as his recent post for information about the hardware. His choices for controller circuitry are way overpowered, sourcing an Eee PC to do the heavy lifting. This is because the choices he made were for easy development and not economy of components. A PC has no problem connecting to Xbox 360 controllers, and the modular control boards mean no complicated circuit design or arduous soldering were necessary. In the end, this looks like a ton of fun and we give him bonus points for repainting the pretty pink plastic that comes standard with these models of children’s toys.